With 55 large remodeled rooms, the Super 8 Motel Niagara Falls offers all guests a choice of either two double beds or one king bed room. Each of the spacious guestrooms is equipped with air conditioning, cable TV, in-room coffee maker, and full size bath. The friendly and courteous staff of this Niagara Falls USA Motel is eager to serve your needs as you look forward to a comfortable, worry free and enjoyable stay. 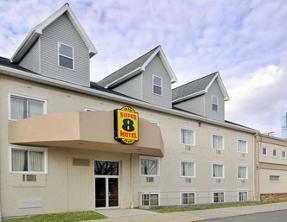 The Super 8 Motel in Niagara Falls, New York is situated directly off Interstate I-190 at Exit 21. Close to all the fun and excitement of Niagara Falls and The Rainbow International Bridge to Canada. Walking distance to many local attractions, site seeing tours, restaurants and shopping is close by for you to enjoy. The motel is only a 10 minute walk to Niagara Falls. The guests at the hotel can enjoy in the year round indoor heated swimming pool. The motel amenities include 24-hour front desk, continental breakfast, high-speed Internet access, restaurant, wake-up services, and parking. The Super 8 Motel guestrooms are equipped with amenities like TVs, coffeemakers, ironing boxes, refrigerators, and microwaves.